CRT repairs components of gas turbine engines that are used in commercial aviation, cruise ships, oil platforms, and naval ships. When engines are completely disassembled for repairs, the parts are shipped to many different repair facilities located around the world. CRT specializes in major engine components that require extensive repairs, such as cases, frames, housings, and shafts. 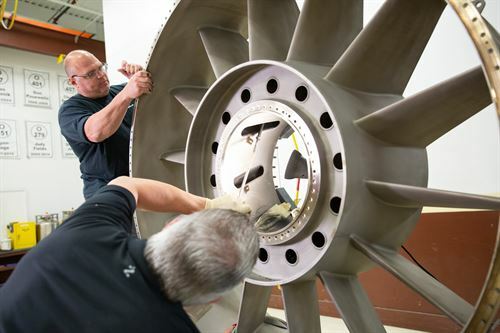 CRT features the largest range of aviation repair processes under one roof in northeast Ohio. 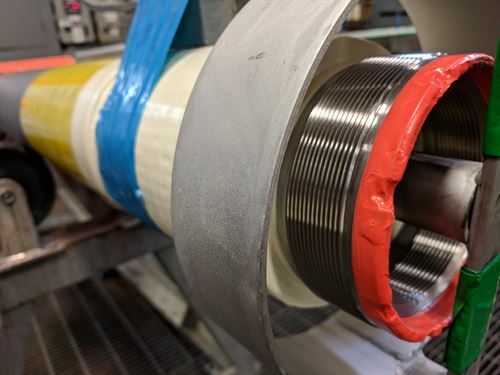 By combining multiple repair processes at one location, efficiency is increased, which ensures our customers receive industry best turn-around-time and cost savings. Learn more by reviewing the many departments below. The Bench Department uses finishing methods to make final adjustments to dimensions and remove excess material remaining after other manufacturing processes. Many of these repairs require finesse and fine motor skills. Finishing methods follow industry standards and the design requirements of the engine manufacturer. Blasting is accomplished by forcibly propelling a stream of abrasive material through a nozzle and onto the surface of the component. Different abrasive materials such as Aluminum Oxide, Glass Beads, and Plastic Media are used depending on the purpose of the operation. Blasting is often required to remove surface contaminants and sealants such as RTV to prepare parts for repairs. Blasting is also required as a surface preparation for paint and thermal spray coatings. Most parts pass through the Blast Department at least once while at CRT, and many go through the department several times due to the multiple applications of Blasting. The Chemical Clean line uses caustic and acidic cleaners to remove surface contaminants from engine components. A clean part is critical for Inspection and surface finishing operations such as Thermal Spray, Shot Peen, Paint, and Plating. Stripping of various types of paints and coatings is also performed using caustic or acidic chemicals. Turbine engine components arrive at CRT after being removed from engines that operate in a variety of challenging environments. Often, a great deal of oil, grease, scaling, carbon deposits, oxidation and corrosion is present on the components which are made of a variety of materials, including nickel alloys, specialty steels, titanium and aluminum. While all metallic materials can be chemically cleaned, not all materials can be cleaned with the same chemicals at the same concentrations and temperature. Specific steps are followed based on the material, the purpose of the chemical operation, size and shape of the component, and degree of cleanliness required. Using many different types of equipment, including local stress units, air ovens, and vacuum furnaces, temperatures of the components are raised from a few hundred degrees to over 2,000 degrees Fahrenheit. This ability permits us to change the physical property of the metals. For example, with some components, we must soften the materials prior to weld repairs and re-harden after the repairs are complete to restore material properties that are required to return the parts to service. Heat Treat is also used to relieve stresses that form in the material during engine operation or repairs, and to bake various coatings that may be applied. The metallurgical-chemical (met-chem) laboratory provides quality control for shop processing applications in Thermal Spray, Chemical Cleaning, Plating, Weld, Shot Peen, and other departments as needed. The Lab’s most frequent activity is metallographic testing of thermal sprayed coatings. Samples are thermal sprayed and sent to the Lab for a variety of tests, including microscopic evaluation. All chemical baths in Cleaning and Plating are also controlled by lab tests. 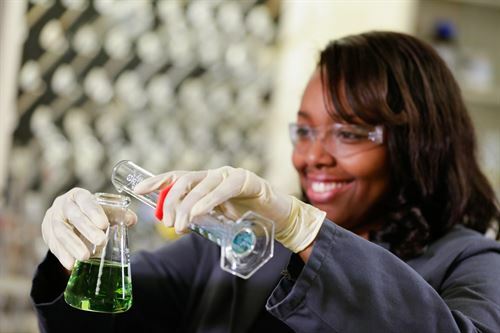 Samples are pulled on a regular basis and tested for proper concentration and condition. Lab personnel handle the chemicals and make additions to the baths. The Lab also makes up the chemical etchants used by Non-Destructive Testing employees to etch materials for crack detection. CRT has a variety of machining processes such as, lathes, mills, and grinders equipped with cutting tools and grinding wheels that mechanically remove material to achieve the desired geometry. 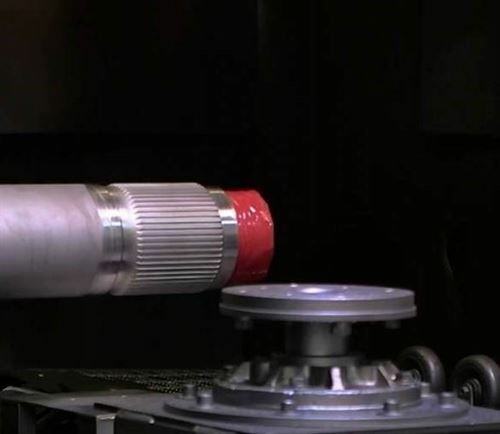 Machining is used for a variety of purposes, including removing damaged or worn material that will be replaced by subsequent processes such as welding, thermal spray coating, and installation of inserts. Machining is also utilized to finish dimensions after material has been added through these same processes. 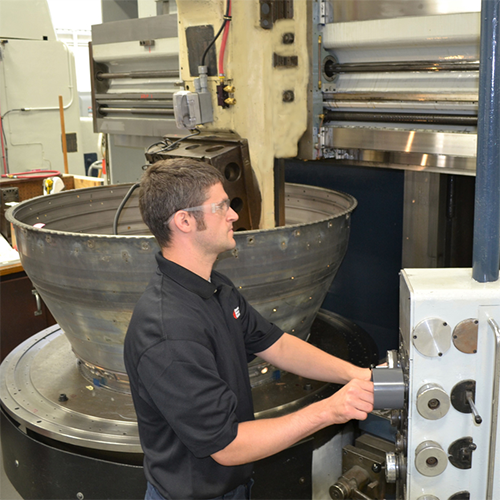 Much of our machining is controlled by Computer Numerical Control (CNC) programs we develop (in-house) to direct machine movements during cutting operations. In repair work, each part is different, and a substantial amount of manual machining is performed, where the machinist directly controls the movement of the equipment to achieve the correct result. Turbine engine components are put under a great deal of stress at varying temperatures and pressures. During operation, engine components can experience wear and tear that is not visible under normal circumstances, such as very small surface or subsurface discontinuities that may lead to catastrophic failures over time. Discontinuities are also sometimes created during repair processes and maintenance activities. It is important to find these potential defects without damaging components. The industry term for these inspections is “non-destructive testing,” or NDT. CRT performs various types of NDT processes including Fluorescent Penetrant Inspection (FPI), Magnetic Particle Inspection (MPI), Pressure Test, Ultrasonic Inspection, Eddy Current Inspection, and X-Ray. 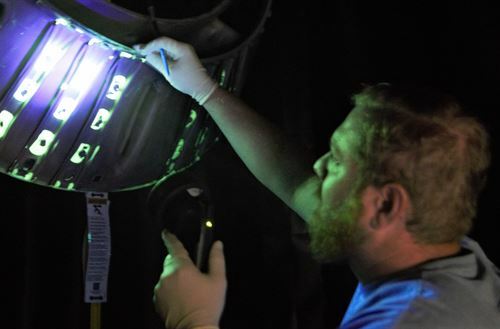 Fluorescent Penetrant Inspection (FPI) is a type of dye penetrant inspection where fluorescent dye is applied to the surface of a non-porous material in order to enhance detection of small surface discontinuities. 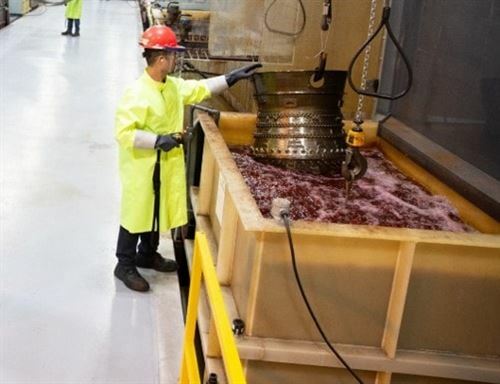 Noted for its low cost and simple application process, the FPI process is commonly used to find defects in turbine engine components, and is used on most components repaired by CRT. Magnetic Particle Inspection (MPI) detects surface and subsurface discontinuities in ferrous materials. After applying an electrical current, a magnetic field is created in the component. Discontinuities disrupt the magnetic pattern and attract fluorescent magnetic particles that are applied to the part while suspended in fluid, making them visible under a black-light. X-Ray is a “volumetric” inspection designed to give the inspector access to subsurface areas of the component, similar to medical radiography. X-Ray is excellent at finding discontinuities generated during welding processes. While X-Ray can find subsurface defects that other NDT methods cannot find, X-Ray is not as effective for small surface defects and is usually required along with surface inspections such as FPI, MPI, and visual inspection. 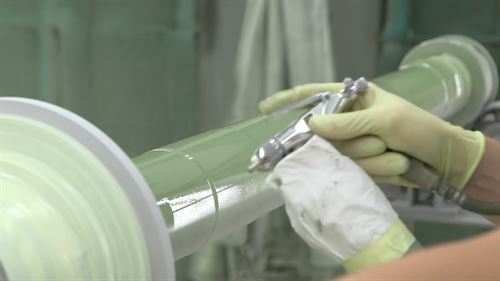 The Paint Department applies coatings to components to protect the surface from corrosion. 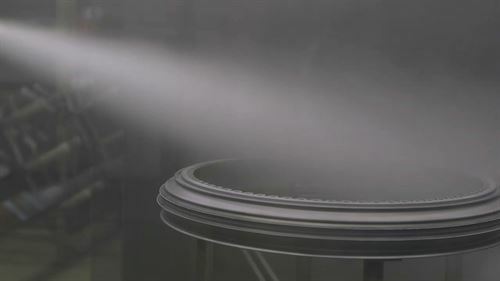 Coatings are applied with compressed dry air (CDA) spray guns in a ventilated paint booth. Anti-gall coatings are also applied on threads and splines to prevent damage from mating parts. Paint Department technicians develop masking, handling, and application skills in support of the process. 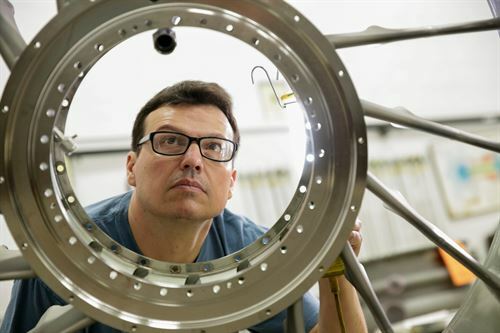 Most of the components that require paint are critical rotating parts such as turbine engine shafts. These critical parts are made of specialty steels that are susceptible to corrosion if not painted. The most common types of paint we apply are ceramic while also applying varnish and epoxy coatings. The plating process applies hard chrome and nickel plating to surfaces such as bearing journals to the outside of turbine engine shafts. Chrome plating is used for bearing surfaces because it is hard and wear-resistant and can be ground to a smooth finish. Unlike decorative plating which is a thin film, the method used can deposit several thousandths of an inch of material during plating operations to restore dimensions after machining operations. In Electroplating, the part is submersed and electrical current is applied through a solution containing the metal to be deposited. The current reduces metal into ions which form a thin coating on the part surface. This coating builds up over several hours to the thickness required. In Electroless plating, a reducing agent is added to the plating bath to split metal into ions, eliminating the need for electrical current. The Plating Department also performs chemical stripping of chrome and nickel plating and some thermal spray coatings. Specialized surface finishing processes may also be performed, such as chromate conversion which protects part surfaces from corrosion. Shot peening is a cold working process used to produce a compressive residual stress layer at the part surface to increase fatigue life. The surface is impacted with shot (small metallic particles) sufficient enough to create plastic deformation. It is similar to sandblasting, except it operates by the mechanism of plasticity rather than abrasion; each particle functions as a ball-peen hammer. In practice, this means less material is removed by the process, and less dust is created. Shot Peen is typically applied to critical rotating components to areas such as splines and oil holes. Thermal spray is a method of applying a tightly bonded coating by spraying molten or semi-molten metallic or non-metallic particles. Coating materials available for thermal spraying include metals, alloys, ceramics, plastics and composites. Some common coatings used at CRT are nickel-aluminum and tungsten-carbide-cobalt. These coatings are fed into the system in powder or wire form, heated to a molten or semi-molten state and accelerated towards the surface of the component in the form of tiny particles. As the particles freeze, they bond to the part and then to each other, creating the coating. Combustion or electrical arc discharge is normally used as the source of energy for thermal spraying at CRT. Surface preparation is critical to ensure that the coating adheres to the surface of the component. Prior coatings are removed and the surface is grit blasted to create a rough surface. Frequent lab tests are run on the coatings to ensure that the process is working and the coating is bonded to itself and to the part. 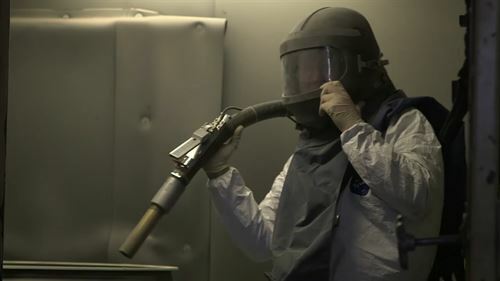 Thermal spraying can provide thick coatings at a much faster rate than other coating processes such as electroplating. Coatings are used to restore dimensions on flanges, other mating surfaces, and to provide thermal barriers. Coatings are usually machined to size after application. Many of the inspections performed on components by an FAA approved Repair Station are visual inspections for service-related wear, hidden damage, handling damage and corrosion. Parts are cleaned prior to inspection. White lights, borescopes, magnifiers, feeler gauges, quickset rubber molds, depth gauges, and scribes are typical visual inspection tools. Defects normally looked for include corrosion, fretting, gouges, bent or worn features, elongated holes, worn or stripped threads, damage from disassembly, coking of internal passages, and missing or broken features. Extensive dimensional inspections are also performed to determine wear and distortion that is both service induced and occurs in the course of repairs. Inspectors make detailed records of part conditions at receiving, in-process, and final inspections. Waterjet stripping is the application of water at high psi to a coated surface to remove the old coating. The process is tightly controlled so that the coating is removed without damaging the metal substrate. Waterjet stripping is much faster than chemical stripping or machining to remove coatings. The parts are loaded into a cabinet where a computer-controlled program is used to pump the water through a nozzle while the part turns. The Welding Department uses Tungsten Inert Gas Arc Welding (GTAW or TIG), and Electron Beam Welding (EB) to repair turbine engine components. 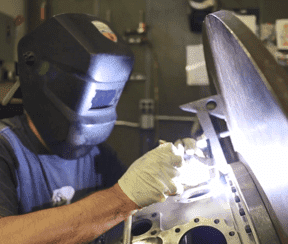 TIG welding is common in the repair of aerospace components because the process produces quality welds with no spatter, and the high level of current and torch control allows for precise application of filler metal by the weld operator. Most of the TIG welding we do is performed by hand and requires highly skilled specialists. We use TIG welding to repair cracks, build up material on surfaces, and replace sections of parts. 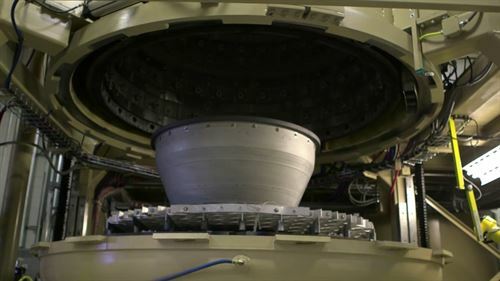 In Electron Beam welding, electrons are accelerated to roughly 30 to 70 percent of the speed of light and directed towards the component being welded, creating enough energy to melt the material and form a fusion weld without requiring filler metal. The mating surfaces of the weld joint must be precisely machined for a good fit. EB welding is often applied to parts that require new flanges, patch repairs, or other section replacements, where the application of TIG welding would cause unacceptable distortion. EB welding is performed in a vacuum chamber to prevent dispersion of the electron beam and oxidation. 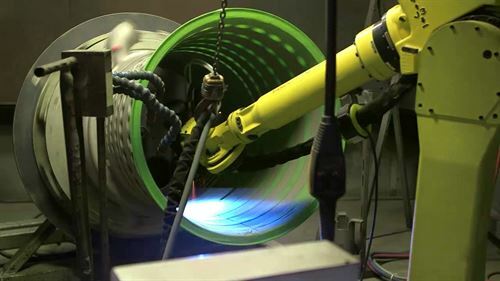 The EB welding process allows for high precision servo-controlled welds to be performed on the components we repair, while causing very little material distortion, and significantly less heat affected material around the weld compared to other welding processes. Copyright © 2018 – 2019 Component Repair Technologies, Inc.